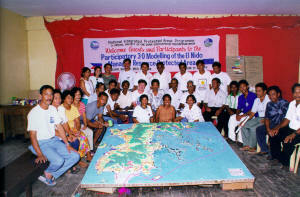 1:20,000 scale Participatory 3D Model (P3DM) of El Nido-Taytay Managed Resource Protected Area, Palawan, Philippines (Yr 1999). The 3D model measuring 4.1 m x 5.6 m covers a total area of 1,968 km2 and includes one Ancestral Land Claim. 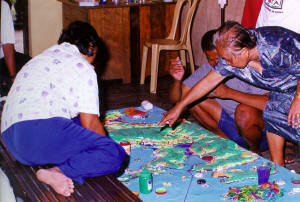 As of the year 2000 the model was located at the Protected Area Office in El Nido proper. It has been used for planning purposes during Protected Area Management Board’s meetings, for awareness raising, introducing visitors to the area, and for discussing resource use and access during planning workshops. Informants (70) included residents of the concerned administrative units (farmers and fisherfolk), Local Government Officials, DENR, private sector (including tourist operators) and NGOs. Used 3-D model for (a) collaborative planning purposes, (b) awareness raising and (c) introducing visitors to the area and (e) education. In line with the 1992 Earth Summit, the European Union and the Government of the Philippines, initiated and co-financed the National Integrated Protected Areas Programme (NIPAP). This is a five-year (1995-2000) intervention aimed at establishing eight protected areas within the framework of the Philippine protected area system. The system strongly supports the participation of local communities in planning and implementing policies and actions to conserve biodiversity. The challenge faced by the Programme has been how to give due weight to the interests of local communities in delineating protected area boundaries, identifying resource-use zones and formulating policies on protected area management. Technical references: DEM source: NAMRIA map at 1:50,000-scale. Digitised contour lines at 40-m intervals, enlarged to 1:20,000. Facilitated Participatory 3-D modelling with 70 participants. Transposed protected area boundary corners resulting from on-field boundary delineation. Extracted data by the use of georeferenced grid and plastic sheets. Done GIS elaboration and produced thematic maps. 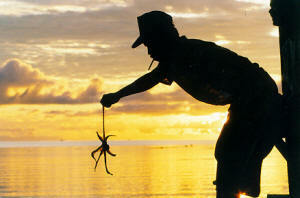 The El Nido-Taytay Managed Resource Protected Area is located on the north-western tip of the mainland of Palawan. In 1991, the Government of the Philippines proclaimed Bacuit Bay as a marine reserve. 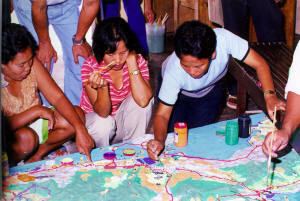 In 1998, the protected area was expanded to include terrestrial ecosystems and portions of the municipality of Taytay. It is now known as El Nido-Taytay Managed Resource Protected Area, which covers over 36,000 hectares of land and 54,000 hectares of marine waters. It contains towering limestone cliffs, beaches, mangroves, clear waters, unique forests over limestone and neat farmlands. It is home to five (5) species of mammals, including the Malayan Pangolin and 16 bird species endemic to Palawan including the threatened Palawan Peacock Pheasant, the Palawan Hornbill and Palawan Scops Owl. 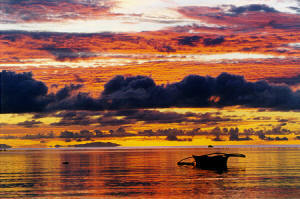 Bacuit bay is also home to the dugong, dolphins and marine turtles, many of which are threatened species. Colorful coral reef fishes are found here. Some of these are the: butterflyfishes, parrotfishes, wrasses, triggerfishes, angelfishes, surgeonfishes, damsel fishes, emperors,snappers, groupers and rabbit fishes. In 1984, the then Ministry of Natural Resources issued a MNR Administrative Order No 518 establishing a 36, 000 hectare area in North-western Palawan as a Marine Turtle Sanctuary The El Nido Marine Reserve was expanded by virtue of DENR Administrative Order No. 14 Series of 1992, upon recommendations of the El Nido and Taytay Municipal Mayors to address livelihood opportunities for fishers. Proclamation No. 32 dated October 8, 1998 was passed to Congress for deliberation. Since 1989, several different government and non-government programs and projects have been introduced in the area.